The PICkit 3 programmer/debugger is a simple, low- cost in - circuit debugger that is controlled by a PC running MPLAB IDE (v8.20 or greater) software on a Windows® platform. The PICkit 3 programmer/debugger is an integral part of the development engineer’.. 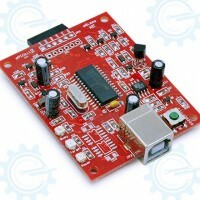 Low-cost USB programmer for ATMEL AVR microcontrollers with ISP features based on Thomas Fischl USBasp and METALAB AVRProg. This clone implements the AVRProg version that has a 1MHz clock source that users can use to recover chips with wrong clock fuse settings. Supported by the following programmin..
A clone of the immensely popular Microchip PicKit2 hardware development kit. It is programmer and debugger rolled into one. Supports incircuit programming and debugging of almost any PIC16F and PIC18F microcontroller variants. 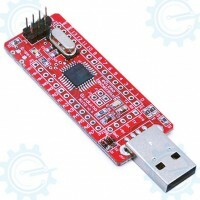 Connects to a PC via USB a port where power to the circuits is also drawn..
"The Bus Pirate is an open source hacker multi-tool that talks to electronic stuff. It's got a bunch of features an intrepid hacker might need to prototype their next project. This manual is an effort to link all available Bus Pirate information in one place. "..